The folks at Fallen Earth have passed along some exclusive postcards, showing off some of the prominent places in the post-apocalyptic Grand Canyon area of their upcoming MMO. 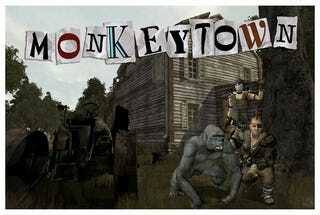 Why don't we take you to...Monkeytown? Yes, scenic Monkeytown, a former animal testing site now inhabited by intelligent talking gorillas who just want to be left alone to farm. Help out the local inhabitants and you might find yourself walking away with a shiny new Monkey Wrench. I can't imagine the developers weren't singing "Funkytown" with altered lyrics the entire time they were building this area. Hell, I'm singing it right now. St. Sebastian's might not be as lyrical as Monkeytown, but it's still a lovely little place to visit. Built from a pre-Fall church, St. Sebastian's serves as a stronghold for the Lightbearers, the faction dedicated to helping humanity emerge from the darkness of post-apocalyptic society. Unfortunately, this postcard contains no monkeys. And neither does the one for Barret Manor, one of the last bastions of culture in the ruined world. The oldest and most interesting families in Grand Canyon Province make their homes in this community, which boasts one of the only intact art galleries on the planet. It sounds like where snobs go when the world dies. These are just a few of the fun places to visit in the Grand Canyon Province. There's also the Tech town of Picus Ridge, where worshippers of technology (aren't we all?) roam free, or New Gallows, a ruined golf course where members of the mutant-hating Human League don't want mutants, baby. Don't want them oooooooh. Head over to the game's official website for more info on the history, factions, and scenic locales of Fallen Earth.